Oh, Yes Sir, we do have the best prices around. How can we do that you say? Well Sir, its pretty simple we have very low overhead and we just pass the savings down to our customers. 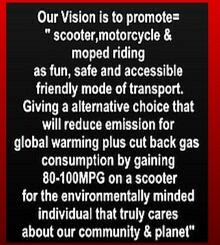 Yes Sir, We have Motorcycles , of course anything over 49CC'S is registered as a motorcycle and needs tags however, we tend to call the ones that twist and go a Scooter & or a Mopeds that range from 49cc and up. We also have ATV'S and even a few quality used Cars. 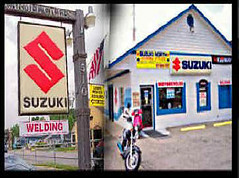 Sure we have some great financing and extended warrantee protection plans if you want a new Suzuki and heck we even have a GAP plan if someone steals your bike or scooter, which will help pay it off with a $0 balance. Come on in and Ill show what I can do to help you save loads of money and get exactly what you want..
We also have a great service and repair shop with experienced technicians that will gladly help you if ever you should need them the only thing we ask is that you call ahead of time and make an appointment so we can have our service guys look it over and call you back with anything it may need to keep it running smoothly. 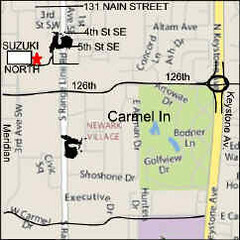 Keystone to 126th street and take the round about West to S Rangeline Rd go North Look for sign on the Left.